Satake hammer mills are widely used throughout the process industries for particle reduction applications requiring high capacities, power efficiency and uniform particle size. The design of the G series mill allows for fast screen changes, making it well suited to producing different products. The grinding action of the hammer mill is caused by a combination of impact from the high tip speed of the free swinging hammers on the product, particle to particle impact and the cutting edge of the screens and breaker bars. The product enters at the top centre of the machine and falls into the grinding area. The centre feed distributes the product across the full width of the screen area giving even hammer wear. Initially the product is impacted by the hammer and is then immediately conveyed to the area between the hammer tips and the screen by a combination of hammer impact, air flow and centrifugal force. In this zone the final grinding action is achieved and the ground product exits through the apertures in the screen. 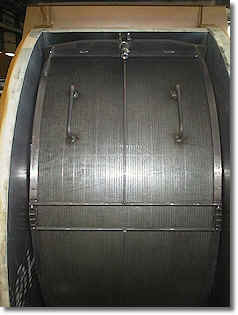 The fast rotation of the hammers also creates a fan effect within the machine and air is drawn in through the inlet with the incoming material and exits through the screen. 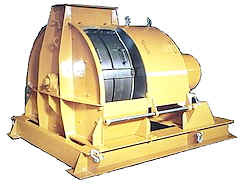 The hammer mill features a top centre feed and fully symmetrical screen assembly, allowing the rotor to be reversed so both edges of the hammers can be used before replacement. The screens are “full”, giving the maximum possible screen area. They are located where extensive tests show that most of the grinding takes place. They are mounted in heavy duty frames which maintain correct clearance between hammers and screens. The rotor is wide, to allow adjustment of hammer configuration and a wide variety of product to be ground, and is supported between two heavy duty outboard bearings. The hinge mounted covers that enclose the grinding chamber can be quickly released for easy maintenance and screen changing. The hammer mill motor size and speed are selected for the application. Motors can be mounted with a vee belt or direct drive arrangement. Above these sizes, Satake offer the CPM Roskamp Champion range of hammer mills.